In the 2004 elections, many seniors were taken in by the Republican claims to “family values.” The majority over age 65 voted for George W. Bush. They gave him a 53 percent approval rating. Since that time, seniors have had a rude awakening. Their approval of Bush nose-dived down to 33 percent, the largest drop of any age group. There was a reason for this drop. By 2005, America’s retirees had seen their pensions and health care plans undermined and their Social Security under clear attack. A frontal assault on the right of Americans to enjoy the retirement plans that they had been promised throughout their working lives was completely unprecedented and unexpected. For senior Americans, three political issues have taken on knife-point sharpness. They are Social Security, health care and pensions. These issues are in addition to concerns that seniors share with other Americans: peace, education and democracy. When President Franklin Roosevelt signed the Social Security Act in 1935, he did so over the strong objections of the Republican Party. As reported in an AFL-CIO leaflet, 99 percent of Republicans in the House and 63 percent in the Senate tried to kill Social Security before it was born. They tried to send the Social Security bill back to committee, where it would have died. After that, Republicans made repeated attempts to end the program, even though it quickly became one of the most successful government programs of all time. In 1978, George W. Bush campaigned to privatize Social Security in his unsuccessful run for Congress. After his narrow re-election in 2004, he said he would use his “political capital” to accomplish this long-held goal. An uprising of American seniors, largely led by unions and the newly formed Alliance for Retired Americans, built up sufficient pressure in 2005 to stop privatization plans. During 2006, some right-wing politicians have kept quiet about privatizing Social Security. Others, including Bush himself, have let it be known that they will try again. Bush has put money in his proposed 2007 budget for privatizing Social Security. Saving Social Security remains a key issue in the Nov. 7 elections. The ARA and unions are key partners in the Coalition to Save Social Security. At the ARA convention in Washington, D.C., this September, ARA was part of a Save Social Security rally on the lawn outside the Capitol. A dramatic event of the rally was the march of a large number of Democratic Party congresspersons, led by Senate Minority Leader Harry Reid and House Minority Leader Nancy Pelosi. They marched from the Capitol to the rally stage to sign the “Golden Promise,” a pledge to vote against privatizing Social Security. To counteract the “Golden Promise,” the falsely named “For Our Grandchildren” group sent each member of Congress a different pledge. They want to “keep all options on the table” including privatization. The regular pensions that the companies pay for are under severe attack. In 1985, there were 100,000 defined benefit pensions. Today there are less than 33,000. Less than 20 percent of workers still have regular pension plans with a defined benefit. Many pensions were lost when companies went bankrupt. That was a form of stealing from workers. Often unions had sacrificed part of a wage increase to win improved pensions. In the past, workers in bankrupt companies were left with nothing. But in 1974, the labor movement won some pension insurance through the federal PBGC (Pension Benefit Guaranty Corporation). However, this insurance does not cover retiree’s health benefits. Loss of medical insurance is a terrible blow when plants close. Little wonder that corporations favor the 401(k) plans that are paid by the employees. There are 700,000 such plans today. The employer may but is not required to pay a matching contribution. The risk lies with the workers. As Enron workers well know, there is no insurance for these plans. The pension paid by the 401(k) plan, if any, depends on how well investments perform. There are now 25 million American workers with no retirement plan, other than Social Security. Also, unlike Social Security, private pensions do not go up with the cost of living. It is the opinion of this writer that we must fight to raise Social Security to a level that provides a decent living for all retirees. Private pensions, unlike Social Security, are in the hands of greedy corporations. These corporations, with the cooperation of bankruptcy judges, are ripping pension plans away from retirees and disregarding all the promises they made to their workers. Like Social Security, Medicare is now under attack by Republicans who opposed its passage in the first place. Seniors were severely disappointed when President Bush rammed the 2003 Medicare Law through Congress. This law, the ARA warns, “is more about dismantling the Medicare program than providing a prescription drug benefit.” Only 181 pages of the act are about medicines. The remaining 500 pages are so-called “modernization,” or destruction of Medicare by privatization. For the first time, in January 2007, there will be a means test for Medicare. Those with higher incomes will pay more. Those with adjusted incomes over $80,000 a year will pay $111.50 to $170.50 a month in 2007. That could go as high as $375 a month by 2009. Some with higher incomes will leave Medicare, a step towards destroying Medicare by privatization. As of Sept. 22, 2006, the majority in the Part D drug program had fallen into the reviled “Donut Hole.” They are pushed into the Donut Hole when they have bought medicines costing $2,250 in 2006. That $2,250 includes what the insurance company has paid plus what the retiree has paid. In the “Hole,” they find themselves continuing to pay premiums but receiving no drug benefit! In 2007, the process starts again. It is expected that seniors will fall in the “Hole” earlier in the year because drug prices are going up. 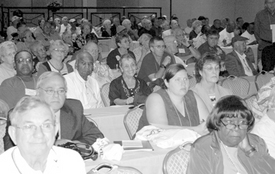 At the September ARA Convention, the retiree delegates passed a resolution demanding, “A strengthened Medicare program with expanded benefits.” Many delegates voiced support of HR 676, a single-payer, universal coverage bill that includes all the retiree demands. The ARA resolution calls for Medicare coverage of early retirees at affordable premium rates; supports repeal of the Part B premiums means-testing and for allowing Medicare to offer a drug benefit directly, with the right to bargain for lower prices. The right wing attacks against all aspects of retirement comfort have made the necessity of organizing agonizingly clear to older Americans. Many AARP members were appalled when AARP helped pass Bush’s 2003 Medicare Act that included Part D. This act increases the profits of insurance and drug companies but threatens the future of Medicare. Fortunately, a new voice for seniors has come on the scene, 3.7 million strong. It is the Alliance for Retired Americans with a strong labor base and a growing number of church and neighborhood clubs. Over 27 states have ARA councils and more are on the way. ARA has incredible potential for organizing beyond its union base. Anyone can join for $10/year: union or non-union, retired or active worker. ARA has a dynamic weekly news service for computer users. Anyone can sign up for it from www.retiredamericans.org. Recently, ARA President George Kourpias put out a national call for Alliance members who are willing to live in key congressional districts during the last four to six weeks of the 2006 political campaign. Expenses would be covered. Volunteers can e-mailor telephone (888) 373-6497 and press option 4. Jim Lane (flittle7@yahoo.com) is a retired Texas unionist and newly active in the ARA. Beatrice Lumpkin (bealumpkin@aol.com) is a leader of Illinois Alliance of Retired Americans and a longtime activist in South Chicago and among steelworkers. George Edwards contributed to this article.